From the makers of Super Sun Sun, Kaiju One has expanded their universe and found a spot for cuteness! 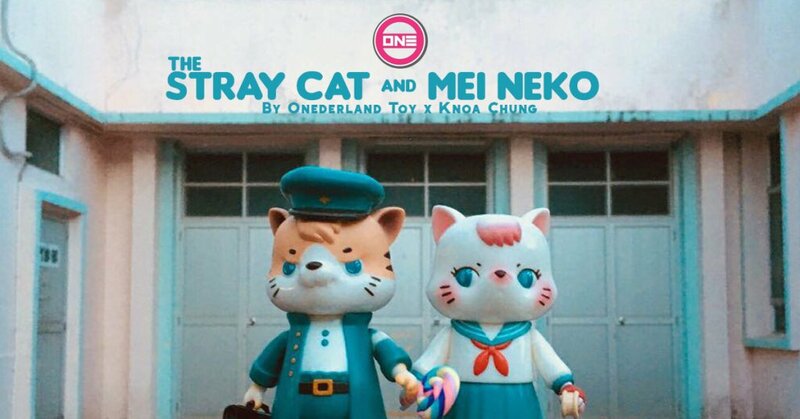 Meet “The Stray Cat & Mei Neko” as the first soft vinyl release from their sister label Onederland Toy (Kaiju One – Pink Label). Enlisting the help of Hong Kong artist Knoa Chung the famous artist behind the lovable Flower Fox and Uncle Ko, the Stray Cat & Mei Neko has been born and ready to rock Nu Designer Toy Salon Event HERE. For us these are cute with that vintage vibe to them both, talking us back down memory lane reading classic Asian comics. To us, they remind us of Sandy and Danny from Grease for some reason. PRICE: Estimated US$100 to US$120 for the PAIR. The Stray Cat & Mei Neko will arrive and be for sale on 2nd September 2018 at Nu Designer Toy Salon Event. Details of the event below. For online sale please stay tuned. Can’t make it to the launch at Nu Designer Toy Salon Event? Email [email protected] with the subject GET ME THOSE CATS and we will do our best to get you onto the reserve list. Onederland Toy (Kaiju One – Pink Label) will be focused on cuter things and if The Stray Cat & Mei Neko is anything is to go by the future looks promising.